Protection from infectious diseases is referred to immunity. That’s why immune prophylaxis is the most potential method of infectious diseases prevention. World experience shows that potential risk of post immunization reactions and complications is very low. And risk of infectious diseases’ complications and mortality really overweight them. Ambulatory pediatrician plays the main role in immune prophylaxis program. Organization of immune prophylaxis is the main prophylactic work of the ambulatory pediatrician. The immunoprophylaxis task is management by immunological answer to prevent the disease beside separate persons and groups of the population. Passive - introduction of ready antibodies. The Calendar of preventive vaccinations in Ukraine (hereinafter - Calendar) includes four sections: vaccination by the age, vaccination by the health, vaccination, conducted in endemic and enzootic areas and the epidemic evidences for recommended vaccinations. 1 Vaccines are injected to all newborns, which has no contraindications. Immunization is done by a vaccine to prevent tuberculosis (hereinafter - the BCG). For vaccination of premature infants weighing ≥ 2000 g should be used TB vaccine with reduced antigen content (hereinafter - the BCG-M). Vaccination for tuberculosis prevention could not be done in the same day with other vaccines or other parenteral manipulations. Children, who were not vaccinated in the maternity hospital for any reason, need to be vaccinated in children's ambulatory departments. For vaccination of children not immunized in the maternity hospital because of medical contraindications BCG-M or half-dose of BCG vaccine must be injected. If the child is not vaccinated in the maternity hospital because of no medical contraindications, BCG vaccine is used. 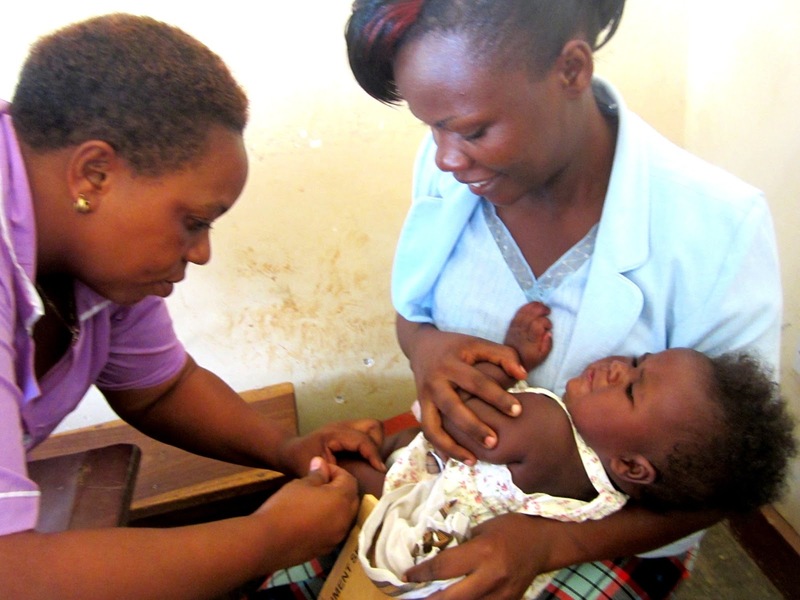 Children who are under 2 months don’t need Mantoux test before vaccination against TB. Mantoux test before vaccination against TB should be done for babies elder than 2 months. A negative test result allows making vaccination. Booster (revaccination) by BCG is given to children aged 7 and 14 years with negative Mantoux test. In the absence of vaccination (BCG) navel children with negative Mantoux test should have additional vaccine 2 years after vaccination. Mantoux test is done with 2 tuberculin unites (TU). Due to the fact that preventive vaccination may affect the sensitivity to tuberculin, that’s why Mantoux test needs to be planned before preventive vaccination. In the other case Mantoux test should be done no earlier than 1 month after vaccination. 2 Immunization by monovalent hepatitis B vaccine is done to all newborns. If mother of a newborn is HBsAg "-" (negative), which is documented, the child may begin vaccination during the first months of life, or combined with vaccination against pertussis, diphtheria, tetanus, polio. In the case of immunization with a combination of vaccination against pertussis, diphtheria, tetanus, polio recommended scheme: 3-4-5-18 months, or: 3-4-9 months. · Newborns weighing <2000 g born by HBsAg negative mothers, vaccination is done when the child’s weight will be 2000 g or at the age of 1 month. · If the newborn child is in critical condition, the child immunization should be done when he will better before hospital discharge. Vaccination against viral hepatitis B of newborns, whose mothers are carriers of HBsAg, is necessary to do by the accelerated scheme: 0-1-2 and 12 months (0 - date of first vaccination at birth, the minimum interval between the first, second and third vaccine – 1 month, third and fourth vaccine - 10 months). The first dose is entered in the first 12 hours of a child's life regardless of body weight. If there is a specific immunoglobulin against hepatitis B with vaccine in other parts of the body is entered a specific immunoglobulin 40 IU / kg body weight, but not less than 100 IU, in this case vaccination may be used for pattern: 0-1-6 months. If the weight of a newborn child less than 2000 grams, vaccination is required, but this dose is not count as a dose of primary immunization; when the child reaches the age of 1 month a series of three doses of vaccine should be done 0-1-6 (0 - date of first vaccination, the minimum interval between the first and second vaccine - 1 month, second and third vaccine - 5 months). If mother’s HBsAg status is unknown, child requires vaccination in the first 12 hours of life, while the HbsAg status of mother is researched. If a result is positive a newborn baby is vaccinated as a newborn of HBsAg "+" mother. For vaccination of children and adults against hepatitis B outside the vaccinations calendar a scheme 0, 1, 6 months is recommended. Do not start the vaccination series, if the dose was omitted, no matter how much time has passed. You must enter a doze, for missing the schedule with the minimum spacing (see section 1.2 "Vaccination of children in violation of the calendar”). 3 Vaccinations for the prevention of diphtheria, tetanus and pertussis in the age 3, 4 and 5 months by diphtheria-tetanus-pertussis vaccine (hereinafter - DTP), or vaccine with acellular pertussis component (hereinafter - DTaP). The interval between the first and second, second and third vaccination is 30 days. The interval between the third and fourth vaccination should be not less than 12 months. The first booster at 18 months is done by DTaP. DTaP is used for further inoculations for children who have had previous complications after DTP vaccination, and immunization for all children with high risk of complications. For the prevention of diphtheria, tetanus, pertussis, polio, hepatitis B and infections caused by bacteria Haemophilus influenza type b (hereinafter - Hib), you can use the combined vaccine (with variations of antigens combinations) that are registered in Ukraine. Vaccination of children less than 4 years off the calendar dates should be done with such calculation, that the child will be managed to get DTP or DTaP immunization fourfold up to 3 years 11 months and 29 days. For children who received primary vaccinal complex (in 3, 4, 5 and 18 months) DTaP or have received three doses DTaP and one DTP, revaccination in 6 and 14 years by diphtheria-tetanus-pertussis acellular vaccine with reduced antigen content (hereinafter - DTaP-M). For children who received for primary vaccinal complex DTP or received two doses DTP and two doses DTaP the first vaccination against diphtheria and tetanus (6 years) by a diphtheria-tetanus toxoid (hereinafter - DT), second (in 14 years) and third (at 18) - by a diphtheria-tetanus toxoid with reduced antigen content (hereinafter - DT-M ). For children, vaccinated against tetanus because the injury by tetanus toxoid (hereinafter - T) over the past two years, a regular vaccination against diphtheria only with a reduced content of diphtheria antigen in diphtheria toxoid (hereinafter - D-M) should be done. Children under 5 years 11 months 29 days, which had pertussis, receive DT. Vaccination is triple, interval between the first and second inoculation 30 days between the second and third - 9-12 months. The first routine adult vaccination by age and epidsituation that were previously vaccinated should be made by DT-M at interval of 5 years after the last vaccination. Further routine vaccinations for adults by DT-M with a minimum 10 years interval from the previous vaccination. Teenagers and adults who have not previously been vaccinated or do not have data on immunization, vaccination is triple by DT-M (interval between the first and second inoculation should be 30-45 days between the second and third - 6-12 months). Revaccination of those teenagers (who are vaccinated outside the scheme) with a minimum interval of 3 years after the last diphtheria and tetanus vaccination. For active immunization against tetanus person elder than 60 years, not vaccinated last 10 years, a shortened vaccination scheme is used (single inoculation T-toxoid in double dose - 20 oz / ml, with a booster dose at 12 months - 10 oz / ml) and further every 10 years with no age restrictions. Do not start the vaccination series, if the dose was omitted, no matter how much time has passed. You must enter a doze, missing the schedule, with a minimum spacing. Because of possible postvaccinal reactions (after DTP-input), such as increased body temperature, which may lead to convulsions, recommend paracethamol in age doses within 1 day after vaccination. 4 Inactivated vaccine to prevent polio (hereinafter - IPV) is used for the first two immunizations, while the oral polio vaccine (hereafter - OPV) contraindications - for all these immunizations on the calendar. OPV vaccine is used for 3 - 6th vaccination (third vaccination and age revaccination) with no contraindications to OPV. After the OPV is proposed to restrict injections, parenteral intervention, routine operations for 40 days, exclude contact with HIV-infected. Do not start the vaccination series, if the dose was omitted, no matter how much time has passed. Enter dose, which lacks the schedule, with minimum spacing. 5Vaccination to prevent Hib-infection can be done by mono- and combined vaccines containing Hib- components. In the case of Hib-vaccine and DTP-vaccine are from various manufacturers they should be inserted in different parts of the body. It is advisable to use combined Hib-vaccines for primary vaccination. 6 Vaccination to prevent measles, mumps and rubella by the combined vaccine (hereafter - MMR) at the age of 12 months. The second vaccine to prevent measles, mumps and rubella - in 6 years. Kids who were not vaccinated against measles, mumps or rubella by age 12 months and 6 years, vaccination can begin at any age before 18 years. In this case, the child should receive 2 doses in compliance with the minimum spacing between them. Children age 15 who received 1 or 2 vaccinations against measles, but not vaccinated against rubella and mumps and didn’t ill with these infections, vaccinations against mumps (guys) or rubella (girls) is scheduled. 18 years or older who have not previously been vaccinated against these infections can be vaccinated with one dose of vaccine at age to 30 years. Previous diseases as measles, mumps or rubella are not contraindications to vaccination by trivaccine. In a history of these two diseases, vaccination should be done by monovaccine against the infection, which the child was not ill before. Women of childbearing age that were not sick and have not been vaccinated against rubella may receive vaccination at their own request in accordance with the instruction to vaccines. In deciding on the vaccination of children in violation of the calendar, you should plan with the following minimum intervals. 4 weeks: if the first dose is introduced to 12 months. 8 weeks (as the last dose): if first dose is entered at the age of 12-14 months. 4 weeks: if a second dose is introduced to 12 months. 8 weeks (as the last dose): if a child age 12 months or more and a second dose was put under 15 months. BCG vaccine does not spend the same day with other vaccines. If necessary, the doctor has the right to enter all vaccines, toxoids, which are shown on the plan (except BCG), per one visit, providing injections in different parts of the body. Otherwise, the doctor plans vaccination with the minimum intervals between vaccines, toxoids and their combination against various infectious diseases. * OPV Vaccination is replaced with IPV throughout the calendar. OPV is not given to family members of HIV-positive person who cares for him. 1. When vaccine vitamins that contain vitamin A should be administered. 2. Vaccinations are carried out in outpatient or inpatient departments. 3. A child patronage by medical workers on 3-4th and 10th-11th day of postvaccinal period should be done. 4. Persons with HIV / AIDS passive immunization by immunoglobulin preparations because of epidemic is independent from previously held active immunization. Persons with HIV / AIDS need to receive additional vaccinations as provided in Calendar section 2, "Vaccinations for health". Vaccinations for health are required in the medical support of patients with high risk of infection and its possible severe course, against which vaccination by age is not provided in terms of vaccinations. Annually. Permission for vaccination of children 6 - month old. The optimal time for vaccination is October-November. Children under the age of 9 years that had not received vaccination against influenza, vaccination is carried out with minimum 2 doses at intervals of 1 month. Or in a specialized department where the child receives the first course of treatment - if not vaccinated earlier. Routine immunization of rabies risky individuals. · Other categories of the population in case of trouble sustainable territories according to the decision of the territorial institutions of state sanitary-epidemiological service, emergency and preventive antiepizootic commissions. · Employees of the especially dangerous infections laboratory departments of sanitary-epidemiological and veterinary laboratory workers who work with live anthrax cultures or infected material. o persons who are in special groups (orphanages, homes for the elderly, children's homes, etc.). o personnel of enterprises, institutions and organizations (to prevent outbreaks). · Person applying for medical help because the bites, scratches, salivation by ill or rabies suspected animals. · Supplementary immunization to persons vaccinated without scheme violating by one-dose D or D-M toxoid vaccination according the age, if the last vaccination for diphtheria has been more than a year. · Travelers to regions with high hepatitis A. · In case of importation of "wild" poliovirus to Ukraine. · In case of measles, mumps or rubella focus vaccination in the first three days from the date of contact children over 1 year who were not ill these infections and were not vaccinated. Adults (before 30 years) if they were not ill these infections and were not vaccinated and revaccinated against them. · In infection focus caused by appropriate serogroup of meningococcus. · Patients who are planned to the surgical intervention. · To children with insufficient antibodies syntheses as a result of congenital or acquired cellular defects of В-lymphocytes. · At absence of vaccines against infection, when single way of protection is introduction of ready antibodies. · If required immediate preventive maintenance of the disease for epidemiological causes (the contact with sick on measles, preventive maintenance of rabies, tetanus). · For neutralization of the antigen-toxin by specific antitoxic antibodies. · With medical purpose at the beginning of the diseases (at diphtheria, botulism, tetanus). Vaсcinal process - is a change of homeostasis, which appears in organism in response to introduction of vaccinal preparation and include the complex of reactions to which belongs: formation of antibodies, adaptation and postvaccinal reactions, postvaccinal complications. Vaccinal reactions appear in response to entering the vaccines, are characterized by appearance of clinical manifestations typical to this type of vaccine, which have a round-robin duration, are short, do not cause serious changes of vital activity in the organism. Severe complications from the previous dose in the form of anaphylactic shock. Allergy to any vaccine component. Progressive diseases of the nervous system, hydrocephalus in decompensation stage, epilepsy, epileptic syndrome with convulsions 2 times a month and more often. 1500 - 1999 g vaccinations are not done up to 1 month. 1000 - 1499 g - up to 2 months. Complicated reactions to previous vaccine (adenitis, cold abscess, skin ulcers over 10 mm in diameter, kelloid scar, osteomyelitis, generalized BCG infection). Anaphylactic reaction to egg protein. 1. Routine vaccination is delayed until the acute manifestations of the disease and exacerbation of chronic diseases will disappear and carried out immediately after recovery or during remission. Acute respiratory disease, that has a mild course and no increase in body temperature, is not a contraindication for the routine vaccinations. Contact with infectious patients, quarantine is not a contraindication for the routine vaccinations. Features of vaccination against tuberculosis – see paragraph 3 of these notes. 2. Immunosuppressive therapy is a therapy carried out by cytotoxic drugs, including cyclosporine A monotherapy, and others, immunosuppressive doses of corticosteroids and radiotherapy. Immunosuppressive therapy with corticosteroids is recognized, if the prednisolone dose is more than 1mg/kg/day and it lasts longer than 14 days, as systemic use. Routine vaccinations with inactivated vaccines and toxoids are conducted after the end of therapy, vaccination with live vaccines - at least 1 month after cessation of therapy. If the duration of corticosteroid therapy is less than 14 days regardless of dose or more than 14 days and a dose of prednisolone is less than 1mg/kg/dayi, or it is used as replacement therapy, or locally, such therapy is not immunosuppressive and is not a contraindication for the routine vaccination. 3. It is unacceptable to unite in a same day immunization against tuberculosis with other vaccines, and parenteral manipulations. BCG and Mantoux test should be done within 4 weeks after infection, which was accompanied by fever or quarantine. 4. After OPV vaccination is proposed to restrict parental interventions during the 40 days. 5. Vaccinations against measles, mumps and rubella after the introduction of blood products (whole blood, plasma, immunoglobulin preparations, packed red blood cells), except for washed red blood cells, is possible within the time specified in the instructions to the drug, but not earlier than 3 months. After the emergency prevention of neonatal tetanus by tetanus human immune globulin BCG vaccination is carried out according to the standard scheme. If the interval between vaccination against measles, mumps, rubella and the introduction of blood products with therapeutic and prophylactic purposes less than 14 days, vaccination against these infections should be repeated. 1. Postvaccinal unusual reactions and complications, caused strictly by vaccine ("true"). 2. Joining of intercurrent infections in postvaccinal period. 3. Exacerbation of chronic diseases and primary manifestations of latent diseases. 1. Increased temperature to 39˚ C.
2. Increased temperature over 39˚ C (severe total reaction). 3. Temperature, which is not registered in medical documentation. 4. Pain, soft tissue swelling > 50 mm, hyperemia in the place of injection > 80 mm, infiltration > 20 mm (severe local reaction). 9. Anorexia, nausea, abdominal pain, indigestion and diarrhea. 2. Anaphylactic shock and anaphylactic reactions. 3. Allergic reaction (Quincke’s edema, urticaria rash, Stevens-Johnson’s, Lyell’s syndrome). 4. Hyporesponsive-hypotensive syndrome (acute circulatory failure, hypotension, decrease muscle tone, short-term breach or loss of consciousness, vascular abnormalities in anamnesis). 6. Continuous scream (duration of 3 hours or more). 18. Superficial ulcers over 10 mm. 21. Generalized BCG infection, osteomyelitis, osteitis. 1. Temperature 37.5-39 ºС, anxiety, poor sleeping, rarely - vomiting. 2. Local reaction (more often on revaccination) - in the manner of hyperemia, infiltration. 4. Febrile seizures (on background of the quick ascent of the temperature). 3. Vaccine associated poliomyelitis in immunized and in contact persons (on background of immunodeficiency) - 1:1,500,000. 1. In some cases from 4 to 12 days - fever, catarrhal manifestations. 2. Rare - a slight enlargement of parotid glands for a short time. 4. Very rare - serous meningitis. 1. Subcutaneous cool abscess (BCG-tis). 2. Superficial ulcers over 10 mm. 6. Generalized BCG-infection on background of immune deficiency (4: 1000000). 7. Osteitis, osteomyelitis with dominating damage of long bones. 1. Behrman RE, Kliegman RM, Jenson HB, eds. Nelson Textbook of Pediatrics. 16th ed. Philadelphia: WB Saunders; 2000. 2. Current therapy in pediatric infectious diseases – 2 edited by John D. Nelson, M. D. – B.C. Decker inc. Toronto, Philadelphia, 1988. 3. Dershewitz RA, Macknin ML: Ambulatory Pediatric Care, 3rd ed. Lippincot – Raven, 1999. 4. Feigin RD, Cherry JD, eds. Textbook of Pediatric Infectious Diseases. Vol 2. 4th ed. WB Saunders Co; 1998. 5. Krugman, Saul, et al. Infectious Diseases of Children. St. Louis: Mosby Year Book, 1992. 6. Oski's Pediatrics: Principles and Practice. 3rd ed. Lippincott Williams and Wilkins; 1999. 7. Principles and Practice of Pediatric Infectious Diseases. / Edited by Saran S. Long, Larry K. Pickering, Charles G. Prober, Philadelphia, Pa: Churchill Livingstone; 1997. – 1921 p.
1. 2000 Red Book: Report of the Committee on Infectious Diseases. American Academy of Pediatricians. 2000: 243-7. 3. Bellet, Paul S. The Diagnostic Approach to Common Symptoms and Signs in Infants, Children, and Adolescents. New York: Lea and Febiger, 1989. 5. Chameides L, Hazinski MF, eds. Textbook of pediatric life support. Dallas: American Heart Association, 1994:5-5­5-6. 6. Collins PL, McIntosh K, Chanock RM: Respiratory Syncytial Virus. In: Fields' Virology. 3rd ed. 1996: 1313-1351. 7. Committee on Infectious Diseases; American Academy of Pediatrics: Respiratory Syncytial Virus. In: Pickering LK, ed. 2000 Red Book: Report of the Committee on Infectious Diseases. 2000: 483-487. 9. Emmerson AM, Hawkey PM, Gillespie SH: Principles and Practice of Clinical Bacteriology. John Wiley & Sons; 1997: 373-88. 10. Fleisher, GR, Ludwig, SL: Gastrointestinal infections. In: Textbook of Pediatric Emergency Medicine. 4th ed. Baltimore, Md: Williams & Wilkins; 2000:757-762. 11. Garwood, John, and Amanda Bennett. Your Child's Symptoms. New York: Berkeley Books, 1995. 12. Griffin, DE: Billeter M, ed. Measles Virus. New York, NY: Springer-Verlag; 1995: 117-34. 14. Ledwith CA: Fluids and electrolytes. In: Handbook of Pediatrics. 17th ed. 1994:94-99. 1. Levin M, Nadel S: Bacterial meningitis: pathophysiology and causes and therapeutic approach. In: Oxford Textbook of Critical Care. Oxford University Press; 1999. 2. Nadel S, Levin M, Habibi P: Treatment of meningococcal disease in childhood. In: Meningococcal Disease. John Wiley & Sons; 1995:207-43. 3. Nelson, WE, Behrman, RE: Infections due to Salmonellae. In: Textbook of Pediatrics. 14th ed. 1992:729-734. 4. Ng VL, Balistrera WF: Hepatitis B-clinical perspectives in pediatrics. Clin Liver Dis 1999; 3 (2): 267-90. 5. Northrup RS, Flanigan TP. Gastroenteritis. Pediatr Rev 1994;15:461-72. 6. Pediatrics ( 2nd edition, editor – Paul H.Dworkin, M.D.) – 1992. – 550 pp. 7. Smith MB: Acute rhinitis and pharyngitis. In: Evidence-Based Pediatrics. 2000: 83-90. 8. Textbook of Pediatric Nursing. Dorothy R. Marlow; R. N., Ed. D. –London, 1989.-661p. 9. Viral Infections of Humans. Epidemiology and Control. 4th edition. New York, NY: Plenum Medical Book Company, 1997. 10. Ward DG: Acute infectious diarrhea disease and dehydration. In: Rosen P, Barkin RM. Emergency Medicine: Concepts and Clinical Practice. 4th ed. Mosby; 1998:1200-1212.